This month we’re going to review one of my favorite hikes, Ice Box Canyon, a challenging, beautiful and really fun trail! I believe that if you were to survey all of the local hikers you would find that Ice Box Canyon is one of the top trails on everyone’s list. To get there, drive eight miles around the scenic loop and park at the well-marked trailhead. Be sure to wear your favorite hat and some sturdy high-top hiking boots for good ankle support. As always take plenty of water along with you. This trail is posted as being 2.5 miles long and is rated “difficult”. I really hope that the difficult rating won’t scare you away from enjoying one of the best hikes at Red Rock. 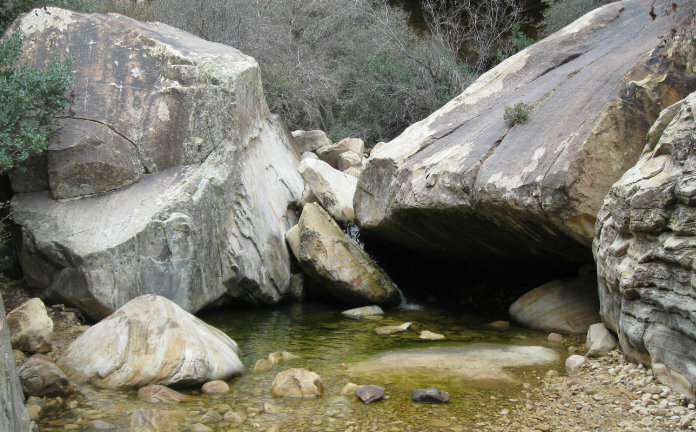 Ice Box Canyon is essentially two separate hiking experiences. OK, three if you’re a rock climber but I’ll let someone else review that part! The trail leads from the parking lot down into Red Rock Wash. This would be a good spot to walk around and explore, even if you didn’t go any farther. The path winds through a grove of beautiful desert willow and lots of nicely water-rounded boulders. At the end of the willow garden you’ll find some wide stone steps that will lead you out of the wash for the remainder of the trek toward the canyon. The grade on this trail averages an easy 2 to 5%, and there’s plenty of desert life along the way to keep things interesting. Be sure to check out the narrowing canyon with the big pine trees below and Bridge Mountain looming above. Rock climbers call the large black wall on the left “The Necromancer”; you’ll call it beautiful. However, this is only a prelude to what lies ahead in part two of the Ice Box Canyon trail! Just short of a mile, the path dips sharply toward the bottom of the canyon. This would be a terrific place to turn back and keep your hike rated PG (for pretty & good), although you might be missing out, because the really good stuff lies just ahead. If you do go down into the canyon, it’s a good idea to drop some mental breadcrumbs so that you can find your way back up later. That river of boulders ahead of you is now the trail. Rock scrambling… and I mean first class-bouldering is about to begin. Just pick your path and go, remembering that there are usually several solutions to every puzzle that you may encounter. You will soon find yourself in a deep canyon with towering black walls on both sides. The main problem with rock scrambling is that you’re always looking at your feet, so pause frequently to take in the beauty above and around you. It’s really astonishing. Along the way you’ll meet some giant butterscotch-scented Ponderosa Pine trees. Be sure to stop and hug them, as they are the ancient guardians of this canyon (and they like hugs). When you get to the end of this rocky path you’ll be rewarded by a spectacular echoing canyon replete with seasonal waterfall. Just above you and out of sight are two natural tanks that are usually full of water. Please use extreme caution if you climb up to these tanks, as the slick rock is treacherous. You may also discover how this area got its name; it can actually get quite cold back here, which makes Ice Box one of my favorite summer hikes. The first part of this outing is very nice and would rate five boots all by itself, but it’s the second and more difficult half that earns Ice Box Canyon a total of 8 out of 10 boots. With respect to images, data, and narrative posted at this website, Friends of Red Rock Canyon makes no warranty, express or implied, including the warranties of merchantability and fitness for a particular purpose, or assumes any legal liability or responsibility for the accuracy, completeness, or usefulness of any information, apparatus, product, or process disclosed, or represents that its use would not infringe privately owned rights. Friends of Red Rock Canyon shall not be liable in any way for loss or damage, of any kind, to you, or any other person, for any inaccuracy, error, omission, or delay in any information posted or otherwise transmitted over this website. While the website tries to accurately describe places and routes, conditions change over time and sometimes mistakes are made. If something posted on this site seems wrong, assume it is wrong and tell us that it needs to be fixed. Wildlands are inherently dangerous — always rely on your own good judgment. You are responsible for your own safety.